How much light will Solatube Provide? 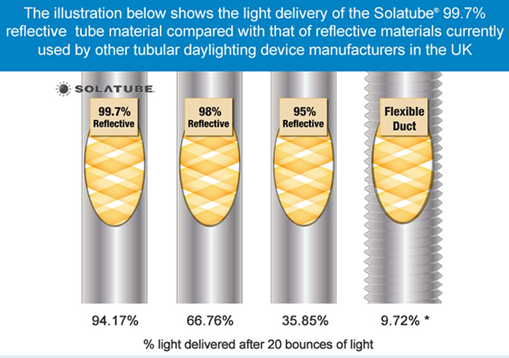 Solatube, indeed any tubular daylighting device, works in a way similar to a window, but not exactly. A window lets in the entire spectrum of light whereas Solatube is designed to filter out the portion of light that fades fabrics while causing sun-loving plants to flourish and produce fruit. For this reason, I think it is misleading for Solatube to use a sunflower to indicate the kind of light you can expect to receive from Solatube lighting. From having lived in London for nine years, I can only say, by way of clarification, that when my friend from San Francisco or I saw the sun come out, we would call each other to rejoice. It was an Event. Most light was diffused through a variety of clouds. Solatube is excellent in that it has more than twice the lumen output of electric bulbs on an average. It’s great for brightening a room, and I’m glad I bought it despite the fact it fails to sustain vegetable plants over the winter due to the way it filters sun rays. It’s also much less costly to put in than a skylight, and, unless you have the skylight specially made, it will filter out the fading spectrum of sunlight and be no more helpful to growing vegetables in winter than Solatube.